Rather than burning log wood in your stove, a Pellet Stove can create warmth by burning small wood pellets. The wood pellets burn very efficiently due to the density of the pellet. Generally, pellets are a byproduct of sawmills or made of corn so they are a good alternative to cord wood. A newer current Pellet Stove is smaller in physical size than the older counter parts. Many companies have incorporated sleek new designs with visible flames providing both heat and ambiance to the room. Some Pellet stoves even have log options and large glass viewing areas to simulate a wood log fire. Pellets burning stoves require electricity to operate the auger and the blower. Some have battery backup options so that can be operated in the event of a power failure. Some units can even be ducted into you home heating system, thus allowing you to heat your entire home. Pellet burning stoves are measured by their heating capacity, in BTU’s – just like the furnace in your home is sized. Most Pellet burning stoves are in the range of 8,000 to 90,000 BTUs so there are there are important size considerations when buying a new pellet burning appliance. Woodstoves-Fireplaces has been in the hearth business for over 30 years so we are able to offer you professional assistance in making your purchase. Pellet stoves and inserts can be manually controlled or for the more sophisticated user, there are models that feather electronic controls that monitor temperature and feed the pellets into the burner accordingly. Some also have sophisticated air wash systems to keep the viewing glass clean of carbon deposits. Ash removal is necessary on a weekly basis. 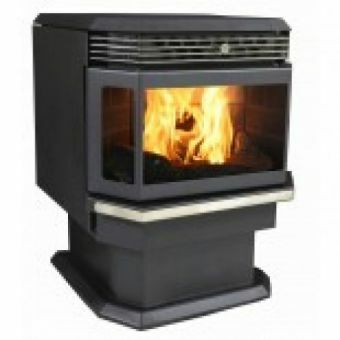 Pellet burning units are available in free standing stove models as well as fireplace inserts. Before you decide on a pellet stove, you should check the availability of pellet fuel locally. Most big box stores carry good quality pellet fuel.